"80% of the results come from 20% of the causes. The 80/20 Principle asserts that there is an inbuilt imbalance between inputs and outputs, causes and consequences, and effort and result. It states that a minority of causes, inputs or effort usually lead to a majority of the result, outputs or rewards. 80% of the value created is likely to be generated in 20% of time when, through a combination of circumstances, the employee is operating at his/her highest level of effectiveness. Any corporation can raise the level of surplus by reducing the inequality of output and reward within the firm. You can do it by identifying the parts of the firm that generate the highest surpluses and reinforcing these, giving them more power and resources; and, conversely, reducing or stopping the expenditure on non-performing resources. 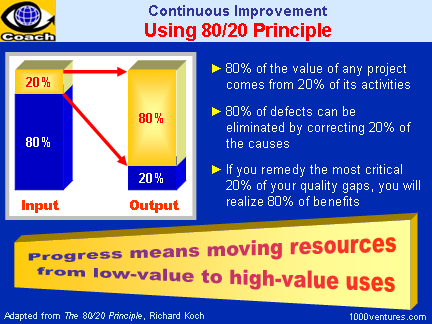 The 80/20 Principle was one of the 'vital few' inputs to the quality revolution which took place between 1950 and 1990. The observation that losses are always maldistributed in such as way that a small percentage of quality characteristics always contributes a high percentage of the quality loss encouraged quality practitioners to concentrate on diagnosis of the few defects causing most of the problems. According to the 80/20 Principle, effort should be focused on dealing with the 'vital few' sources of off-quality products, rather than tackle all the problems at once. If you remedy the most critical 20% of your quality gaps, you will realize 80% of the benefits.